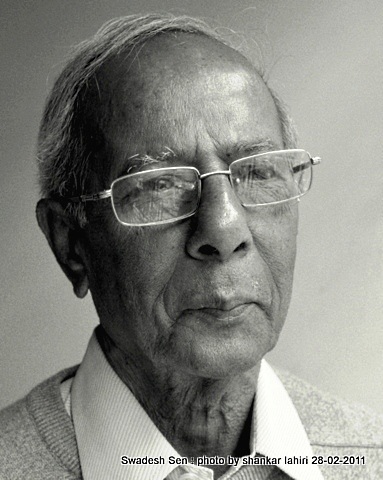 Poet Swadesh Sen passed away on March 6, 2014. Amitava Nag remembers him as one of those bridges between the fluidic ornamentation of the 70’s and the grounded post-modernist of the 90’s. Swadesh Sen passed away as the melting summers prepare to latch upon the laziness of sultry nights – in Jamshedpur, probably. Probably since I don’t know if he breathed his last in the city which grew up to be a synonym for many things – from the Tata-s to the revolutionary Bengali literary magazine Kaurab. In those romantic 90’s, in College Street when we were hoodwinking our creative acumen in want of greater virtues, we always aligned with the ‘lesser known’, ‘uncompromising’, ‘honest’ artists. That is how a Bengali grows up even now, we didn’t have a Left or a Right – for us the Left is right, always with all the different connotations of the term. In a land where self-prophecy and media hawkishness is the cult of the day, Sen chose to remain away from the centre, chose to be aloof and hence undisturbed and unperturbed. Whether he liked this stance or this was in a way forced on to him, I don’t know, I never met him in person but only through his simple, minimalist rendition of the nothingness of life through his verses. He was one of those bridges between the fluidic ornamentation of the 70’s and the grounded post-modernist of the 90’s. His poems seemed private and animate, something you can probably feel with your senses. Some of his poems you will find on Swadesh Sen Kalimati. Yet, no big publisher chose him to be their bandwagon. And for many city-dwellers like me, who continued to work in government organizations, in capitalist companies and foreign money-mongers – how apt he became an icon of what all which we are not. Like a few others, his positioning as an un-favourable poet in terms of success fulfilled our misled dream of licking on to an ‘anti-establishment’ wound which we loved to sublimely keep alive for our own mortal benefits. Being in Jamshedpur and staying away from the crowd also proved the capitalist mind in the Bengali head – where Kolkata is the only place to be – from corporate dungeons to literary humbugs. That’s how we ignored Satinath Bhaduri, that’s how we look away from Swadesh Sen. I am not an academician, not even an avid reader and hence I could never be able to link William Carlos Williams to Swadesh Sen aptly like many had done since we started reading Sen in the 90’s. In those Presidency years it meant a lot to relate, and correlate and in the process miss the nuances of the commoner, who would be the king, metaphorically. Nor can I thump in conviction how unique was Sen in the poetry oeuvre, in Bengali language itself. May be an unbiased researcher will try to fathom Sen’s place – irrespective of colonial hangovers in Kolkata or in exploiting the conundrum that he is good cause he was never famous. Perhaps the best way of paying your tribute to him would be translating him? This would give him a wider audience. I really liked this. Amitavada, may be few of you like people… deep, thoughtful, honest, transparent and truly modern … yet in your language, sitting in womb of “government organizations, in capitalist companies and foreign money-mongers” can start the informal practice of Swadesh Sen’s journey of “simple, minimalist rendition of the nothingness of life” to introduce this to the newer generations in their cup of tea to a certain extent. Thanks for the liking. Kaurab magazine had been steadfast in their support of Mr. Sen. There wouldn’t have been a Swadesh Sen without Kaurab. I am no academic and ill-equipped to write in-depth discussions on literature. The same reason why translation is a rather difficult task. Thanks Amitava for this wonderful tribute to Swadesh Sen! Had it not been for this article I might not have ever known about him. Even in these times of “self-prophecy and media hawkishness” there are people who write because they love and enjoy writing, rather than write for name, fame and money. I believe Mr. Sen was one of them. Though you might not be an “academic and ill-equipped to write in-depth discussions on literature” I feel its people like you (along with magazines like Kaurab) who can and do hold aloft the torch for the lesser known artists. I look forward to more such enlightening write-ups of yours about the lesser known artists. Though this is in Bengali. So only friends who can read Bengali will be able to savour it. This type of analyses are rare and this is what I meant by saying that I am ” ill-equipped to write in-depth discussions on literature”. Hope everyone enjoys reading it and finds the gems in the poet’s verses. Amitava, few nowadays outside of Bengal can read the Bengali script. To find the gems, they have to dive into the waters of the verses. If only someone like you translates the Bengali verses, a larger section of poetry aficionados can enjoy these not-so-well-known pearls. So listen to Maitreyee and take the plunge into translation. Swadesh was my school mate at Jamshedpur’s R D Tata High School and we also lived nearby in Jamshedpur.We both dabbled in poetry for long till I moved out of Jamshedpur and came to Kolkata, then Calcutta. I lost touch with him and only around 2011, after my return from Europe, where I worked for long as a journalist and later as executive secretary to the World Peace Council, I found out Swadesh was still in the steel city and is a wellknown poet. I got in touch with Kaurab and also wrote to Swadesh that next time I am in Jamshedpur, I will look him up. Alas my wish remained unfulfilled. I can only convey my deep condolences to his bereaved family.